Slate polymer roof tiles from DaVinci Roofscapes. Whether you’re building a new house or replacing the roof on your existing home, it’s important to make sure the roofing you choose is both durable and attractive. Polymer roofing from DaVinci Roofscapes fills the bill in both departments. DaVinci polymer roofing is virtually maintenance-free, has a lifespan of 50 years or more, and is backed by a Lifetime Limited Material Warranty. The roofing has been rigorously tested for impact resistance, fire retardance, the ability to withstand freeze-thaw cycles, and extreme winds up to 110 miles per hour. 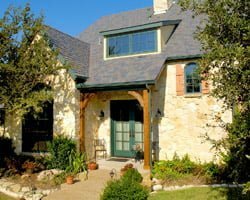 In addition, DaVinci roofing is beautiful to look at and available in a wide range of styles and colors that match the natural textures of quarried slate or hand-split wood shakes. DaVinci slate tiles come in both single and multiple width styles. With their chiseled edges and natural stone-like texture, DaVinci’s tiles look just like real slate. Single-Width Slate tiles are a uniform 12” wide for a clean, simple design. They also feature DaVinci’s proprietary VariBlend technology, which creates a continuous color variation from tile to tile, making them look even more like real slate. DaVinci Multi-Width Slate tiles give your roof a more organic, natural look. The tiles are available in five different widths, ranging from 6” to 12” wide, that can be laid in a straight or staggered pattern. Multi-Width Slate tiles are formulated from a palette of 24 earth tones and are available in 50 different colors, allowing you to create a wide variety of color blends. DaVinci slate tiles are also available in their easy-to-install Bellaforté line, which features an integrated rain gutter, leading edge tab, and self-aligning ledge. DaVinci composite cedar shakes look like real cedar, with amazingly realistic wood tones ranging from freshly cut wood to weathered grays and browns. DaVinci wood shakes are also available in single width and multiple width styles. DaVinci Single-Width Shakes are a uniform 9” wide, with an even pattern for an uncluttered look. They are available in a full spectrum of authentic cedar colors, from autumn brown to weathered gray. Multi-Width Shakes come in five different widths, ranging from 4” to 9” wide. They can be installed in either a straight or staggered pattern to give your roof a more natural appearance. DaVinci shakes are also available in their Bellaforté line, with fast installation and beautiful results. House with DaVinci Multi-Width Shakes on gables. In addition to the wide range of standard color blends available for both slate tiles and shakes, you can also create your own custom color blend from the 50 standard colors using the Color Designer tool on the DaVinci website. Just select the type of slate or shake roofing you’re interested in, and then apply up to four different color combinations to your selection and see the results instantly. DaVinci roofing products are also available in EcoBlend cool roof colors that help reduce cooling costs by reflecting sunlight and heat away from your home. DaVinci EcoBlend tiles have earned the designation as an ENERGY STAR qualified product. In addition, DaVinci Roofscapes products are 100% recyclable, so they contribute less to landfills, and have a smaller carbon footprint.